BEST Gluten Free Banana Bread Recipe - No Eggs, Vegan! I had good intentions for that bunch of bananas on my counter, but they’re too ripe & so mushy it makes me gag at the idea of eating them. For a split second I’m tempted to throw them away, but I hate to throw away food. 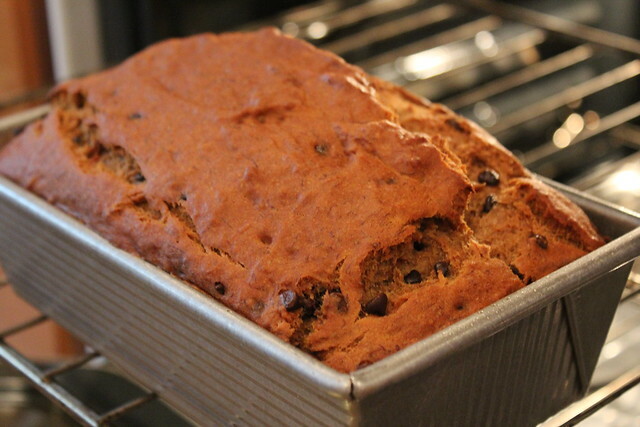 Then a little bell goes off & I remember… it’s BANANA BREAD to the rescue! 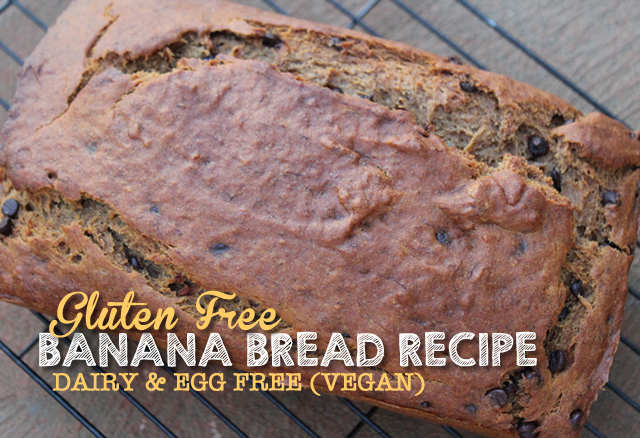 This Gluten Free Banana Bread Recipe is also Dairy Free & Egg Free (Vegan) & contains No Refined Sugar! I am always shocked by how big the loaf rises in the oven & my family can hardly wait to get a slice. If you’re looking for my other Banana Bread Recipe that uses Regular or Gluten Free Flour, Eggs, Flax & Honey… you can check out my Monkey Muffins Recipe over here. This Gluten Free Banana Bread Recipe is SO GOOD! It is Egg Free, Dairy Free & has no Refined Sugar. It’s moist, delicious & made with whole food ingredients. In Small Bowl, whisk together your Dry Mix Ingredients & Set-Aside. Place Ripe Bananas in the bowl of your Stand Mixer fitted with the wire whisk & whisk on Medium-High Speed until bananas are mashed completely. Add in your Sugar, Coconut Oil & Vanilla & mix again on Medium-High Speed for 1-2 minutes until everything is smooth and well incorporated. Add your Dry Mix Ingredients to the Stand Mixer & mix all ingredients together well on Medium-High Speed for approx. 1 minute. Stop to scrape the sides of the bowl if necessary. Mix in any Optional Ingredients on a Low-Medium setting until just incorporated. Spray your 9″ x 5″ Loaf Pan with non-stick spray. I use the USA 9 x 5 x 2.75 Loaf Pan & I love its consistently good results. Scrape all of the batter into your prepared Loaf Pan (it should fill the pan approx. 2/3 full). Place in your pre-heated oven & bake for 45 – 60 minutes – or until the bread reads 210-220 on your digital thermometer & the tester comes out mostly clean (banana bread is always slightly moist). Tent the top of the loaf with aluminum foil if it is browning too quickly. Once fully cooked, remove the loaf from the oven & immediately turn out onto a cooling rack…. DO NOT let the loaf sit in the pan. Let cool completely before slicing. Banana Bread should be light, moist & soft. Leftovers are best stored in an airtight container or ziplock bag on counter for 2-3 days or in the Refrigerator. The batter mixture should have good flow… If it appears too thick, add a little bit of milk alternative to loosen it up before pouring in to the pans. This recipe makes perfect Gluten Free & Vegan Banana Bread Muffins too! The batter starts out only filling about 2/3 of the pan… but after 10 minutes in the oven, it begins to rise above the pan… and with no eggs! Look at that beautiful rise! 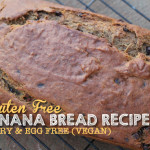 Even without eggs, this Gluten Free, Vegan Banana Bread Recipe is moist & yummy! Thanks a lot I really needed this recipe for the summer.I can’t keep my bananas long because of knats,so thanks a lot you save my bananas. son can’t eat gluten so is excited to try this. 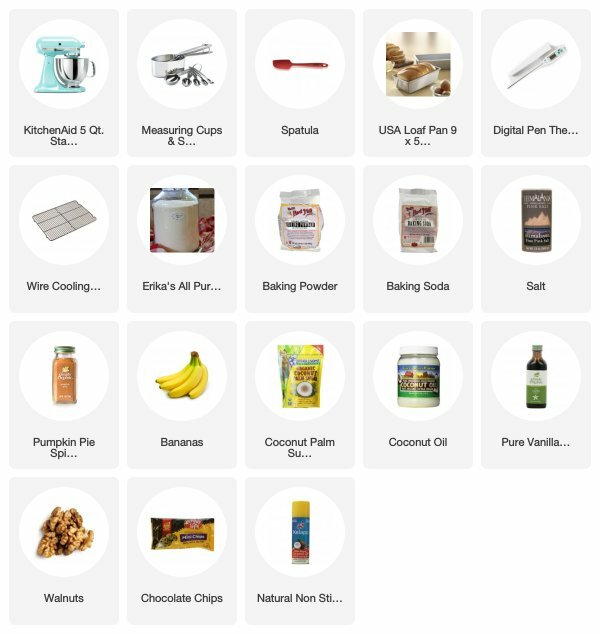 Can I use olive oil in lieu of coconut oil in the banana bread recipe? 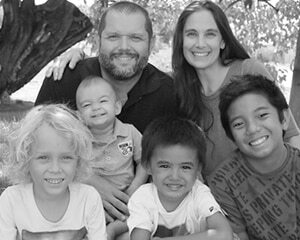 First thing I’d like to say how much I enjoy your website and recipes! That being said, before I mix up a huge batch of your soft white flour bread mix, can you break it down into a single batch? I want to try it first to make sure it’s what I’m looking for. Thanks so much!!!! I love your blog. I am so glad that I found it. I tried your banana bread recipe.They are good fluffy and moist. My daughter loves it. She is allergic to wheat and eggs. I am new at this just found out my son have tto use gluten free/eggfree product and I don’t know how to go about doing things for him to eat.I will have to try your bread and see how it turn out send me more receipe. Hi, I am gluten free and dairy free by allergy and vegetarian by choice. I was just wondering if this recipe will still work if I use another brand of gf baking flour? Thanks for sharing this recipe I cannot wait to try it! The coconut oil remained very lumpy in the batter and no amount of mixing got the lumps out! Was I supposed to melt it? It was at room temperature when added. I made it with a gluten free flour from the store and I have added 1 teaspoon of guar gum. I have used pecans that I have toasted instead of walnuts. 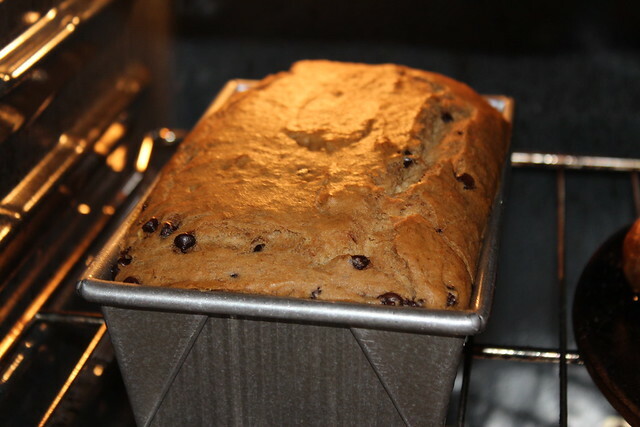 I had doubt….because gluten free cooking is new for me but…the best banana bread I have ever eat! I just made this ! 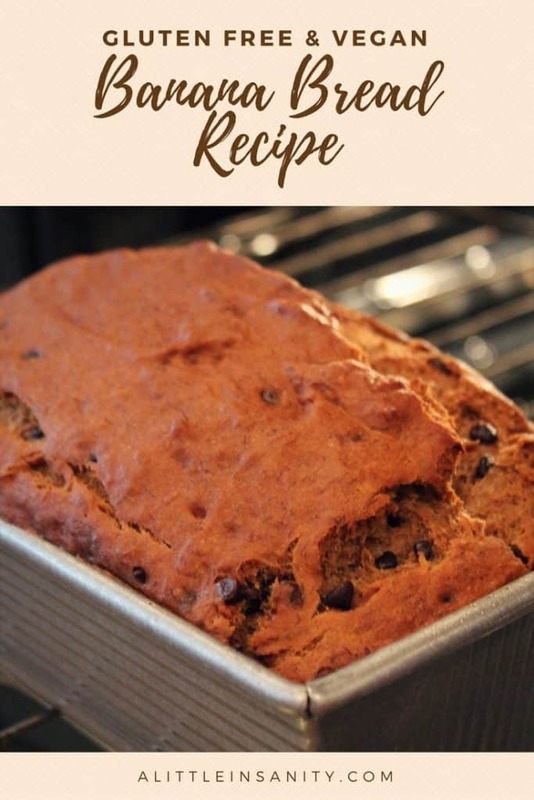 I must say it is by far the BEST banana bread recipe I have tried and the bonus is the gluten free part. I will definitely make this the banana bread recipe for my family! Hi there! I’m veeeery new to GF baking. I tried the banana bread recipe and the taste is good but it is gummy in the center. Can you tell me what I did wrong? I’m sure that’s a novice question. ? This is definitely yummy! I love all the recipes on your site so far! One problem I’m having though– the banana bread still had a raw spot in the very middle and it was cooked for 60+ minutes. I just kept cooking and cooking and cooking. After slicing it and getting to the raw part, I wrapped it in fool to cook some more, and it still ended up being a little raw. Maybe since I didn’t melt the coconut oil before adding to the mixture? I’ll have to try that next time. Thank you for all your recipes. Holy smokes, you have such a gift! These are so lovely, we have no words to express it…yum! I made into muffins and baked perfectly in 22 mins at 350 degrees convection bake. 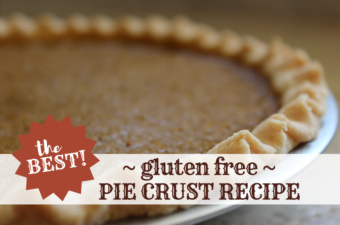 You have made the transition to gluten free a breeze with your homemade goodness. I am also on my second loaf of your easy to make gluten free bread. By far the best banana bread recipe I’ve ever made or tasted. I sub 1 cup of pumpkin pie filling for 1 banana and add a ton of chocolate chips. HI, My name’s Arlene and I am ecstatic to see that someone else has found uses for over ripe bananas. It pains me to see people just toss them in the disposal. As I am reading your recipes I have a banana bread in my oven and the house smells awesome! I notice that we use pretty much the same ingredients in our recipe. However, I do like to get a little more creative at times which is totally doable with banana bread pretty much anything goes. I am a health nut and the things I opt to put into my bread guarantees that I can grab a slice on my way out the door on my way to my morning hike and feel pretty amazing. Keep posting your wonderful recipes for everyone to enjoy. It was a little denser than I’m used to but still really good. I used store bought gluten free flour and room temp coconut oil. It did take about 65 minutes to bake but that could have been the glass baking pan. The only complaint I have is the batter was too thick once I started beating it so it was really difficult to incorporate the flour at the bottom of the bowl and the walnuts since I had to use a regular mixer. I found your site after I found out I was severely wheat and gluten allergic. 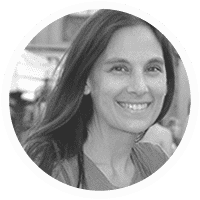 Husband is not as severe as me but we love the gluten free recipes from your site. Thank you so much. I wanted to try this recipe but with Pumpkin instead, since we already tried it as is and loved it. Again Thank you for the awesome tasting recipes. I just made this banana bread and it is delicious!!! I also had to bake mine for about 65 minutes. If I wanted to make muffins does the baking time change? I made this a while back and loved it! I don’t think it lasted 24 hours! 2/3 of the household is not gluten free but I don’t think I”ll ever make another banana bread again if it isn’t this recipe! Have you tried a pumpkin bread recipe? I’m thinking about substituting pumpkin in place of the bananas and maybe adding a bit more pumpkin pie spices. Just curious if you have tried that yet. Thanks Erika for this. It was a success! For someone who doesn’t bake, I was thrilled to be able to make a treat for my toddler who has eczema. So this gluten & dairy free recipe is exactly what I need! I did not use the pumpkin spice though as we don’t have it here. Regardless, it tasted yummy GF standard! Hi Erika! This recipe is amazing! Since it’s only me who eats gluten-free in my family I was wondering if you know if this bread will freeze well. It would be great if I could save it from going bad before I can eat it all! Made these to get rid of some bananas in the freezer. 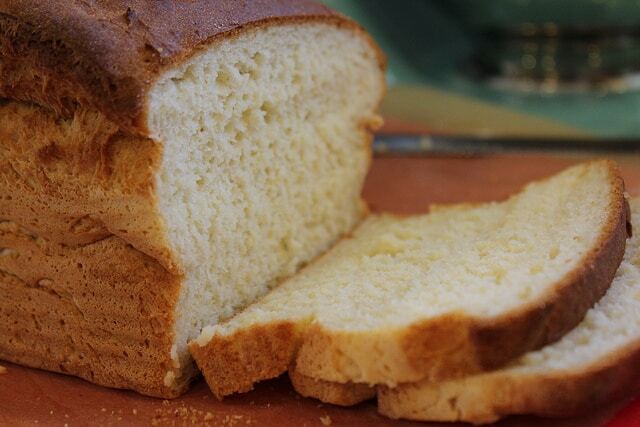 I am gluten and dairy intolerant – my husband is neither and devoured almost the entire loaf! It’s such a good feeling to indulge in something sweet knowing that you’re not about to regret your decision :) Thank you! Erika, thanks so much for sharing all your recipes! I wanted to know if your bread recipes, including this banana bread recipe, can be used in a bread machine. Thanks! Oh my goodness! THis is the best gf banana bread recipe I have tried. It came out perfectly as muffins and tasted just like how I remember regular banana bread to be. Thank you! Such a great recipe! The best BB I have ever made and my bf approved. I tweaked it by using 1/4 cup of spelt flour and reduced the amount of all purpose GF flour, cinnamon instead of pumpkin spice and added one flax egg replacer. Also used four bananas and reduced sugar to half a cup. Still tasted amazing. Thank u. Hey Erica, I have egg replacer in the cupboard, could I use that instead of the baking Sodas and powder? OMyTasty! This bread is perfect..PERFECT. I used one cup banana flower and the rest cassava. Boy oh boy. My daughter is allergic to wheat, barley, eggs, dairy, soy and peanuts. Your recipe is my go to recipe for banana bread and muffins. My husband, who rarely tries my gluten free vegan concoctions, prefers these to regular banana muffins. They are so light, moist and delicious. 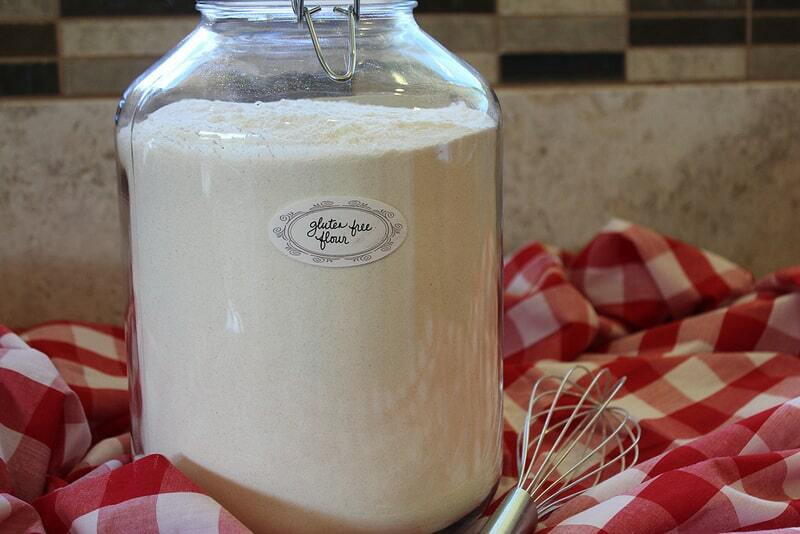 We use our store brand gluten free flour, and so far, every brand I have tried has worked. Hey, I was wondering if I can use Stevia or honey as a substitute for coconut palm sugar? As well as coconut flour instead of gluten free flour? WOW!! I’ve been vegan for 8 years and GF for 6 years and I’ve never had such a great recipe for banana bread. This is truly wonderful. I was a little concerned that all that baking powder would give the finished bread a “taste” BUT IT TOTALLY DIDN’T! it came out with a lovely, very light “crisp” on top. I didn’t have anything on hand to mix in, but it would be absolutely mind-bending with walnuts in it. (It’s already pretty mind-bending as it is, tbh). AWESOME RECIPE! THANK YOU! !